Honorees for annual InfoComm 2017 Awards will get their prizes during InfoComm 2017 in Orlando in June. InfoComm 2017 Award winners receive their awards in a ceremony at InfoComm 2017‘s Center Stage at the Orange County Convention Center in Orlando on Wednesday, June 14, at 2 p.m.
InfoComm International has announced the recipients of its InfoComm 2017 Awards, with honorees ranging from a retiring industry pioneer to youngsters who’ve made their mark on the space in important and meaningful ways. Honorees will receive their awards in a ceremony at InfoComm 2017‘s Center Stage at the Orange County Convention Center in Orlando on Wednesday, June 14, at 2 p.m.
Gentner founded Gentner Communications in 1981. He developed the first channelized acoustic echo canceler for telephone and videoconferencing applications. In 1997, Gentner founded Listen Technologies to provide wireless audio solutions for applications such as assistive listening, guided tours and language interpretation. He is passionate about raising awareness of hearing loss issues, advocating for greater accommodations to help those with hearing loss and educating people about listening solutions. With a career in AV spanning 30 years, Bowie has been a pioneering systems engineer and the CEO of Electrosonic. Bowie has been very active with InfoComm for years, supporting training programs and the Certified Technology Specialist (CTS) program. In 2011, Bowie launched an apprentice program at Electrosonic. The unique, one-year program exposes individuals to the company’s core departments, allowing them to gain a deep understanding of project flow and business strategy. Bowie will step down as CEO of Electrosonic at the end of June. Nattress has been active with InfoComm for 17 years, serving important roles with the board of directors and the Leadership Development Committee, the Professional Education and Training Committee (PETC) and the Certification Subcommittee. He was instrumental in the development of InfoComm’s CTS certification. Educator of the Year Award: James Maltese, president of Audio Visual Resources Inc.
Maltese has been an instructor for InfoComm for the last 15 years, teaching design and prep classes in addition to delivering presentations on industry quality and trends. McGoldrick began her business Immediate Connections more than 30 years ago with $3,000. Now, with seven offices across the U.S., her company generates sales revenues in the millions providing AV staffing for live events. After Hurricane Katrina, McGoldrick played a big role in helping her New Orleans employees get back on their feet by bringing them up to the company’s Boston headquarters for work. She secured a $10,000 grant from InfoComm to help with the staff’s relocation. In 2008, Mukhopadhyay joined IAV India, among the top five AV systems integrators in the Asia-Pacific region. That same year, she co-founded AVID India. Mukhopadhyay has been successful in establishing mandatory training and certification within both organizations. Additionally, she leads the Women of InfoComm Network in India. Brameld is heavily involved in developing standards for the AV industry. He is the former chairman of InfoComm’s Standards Steering Committee and has served on various task groups devoted to publishing standards accredited by the American National Standards Institute and industry-specific InfoComm standards on practices such as cable labeling and rack building. He speaks internationally about standards and at InfoComm plenary sessions. 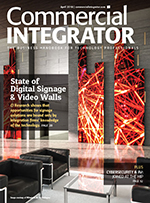 Since taking over management of the Peerless-AV marketing team in 2013, Dutta has created a cohesive message for the company, guiding its image from a display-mount manufacturer to its current position as a leading AV solutions provider. She is currently chairman of the InfoComm Exhibitor Advisory Committee and has been a member of the Exhibitor Committee since 2007. Johnson is avidly involved with InfoComm, having served on PETC for four years, the Young AV Professionals Council and the 2016 AV Executive Conference planning committee. In addition, Johnson is currently Chair of the Live Events Council. At the age of 28, he was promoted to Vice President of Operations for the live events division at AVI-SPL where he grew the department in scale, services and profitability. In his current role at Mertzcrew, he focuses on providing an AV software platform that supports the live events community.